Paso Prime grass-fed beef, Braggs Organic soy sauce, worcestershire, water, garlic salt, cayenne pepper, Secret Sauce, organic brown sugar, black pepper, liquid smoke. The first flavors to hit my palate is worcestershire with touches of soy sauce, and a light garlic. I can soon pick up a faint spicy burn, along with black pepper. The chewing brings on a light natural meat flavor. There's also a tanginess in the chewing, perhaps from the worcestershire, but also faint notes of citrus zest. The primary taste profile of this jerky, however, is worcestershire and black pepper. But there's a lighter mixture of pungent, tart, and fruity flavors in the background that perhaps makes up the "Secret Sauce" ingredient. These flavors don't contrast the worcestershire, but instead mimics it and adds more dimension. It's like a worcestershire sauce with its components magnified for greater clarity. There's noticeable spiciness to this, mostly from the black pepper. But there's also a light bit of chile pepper heat, likely from the cayenne. On my personal heat scale, I'd rate this as "mild medium" (level 2 out of 5). The meat consistency is excellent. I see little to no fat on these strips, though I encountered light stringiness. The chewing texture chews and feels just like real steak, cooked medium. It's chewy, but not tough, and lightly moist. 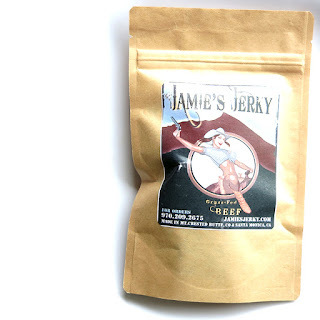 Jamie's Jerky strikes an excellent balance between meat consistency, chewing texture, and taste. I found a bold, spicy flavor based on a worcestershire marinade, but enhanced with ingredients that seem to make the worcestershire "pop". It seems to come alive through it's lightly tangy, and fruity notes. 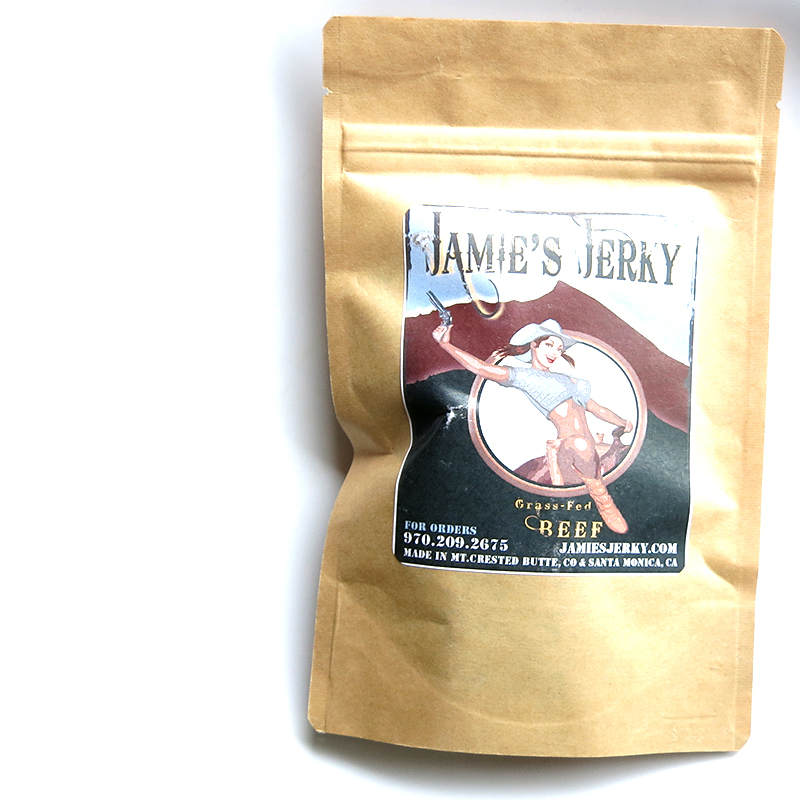 It's a great jerky for spicy food addicts without being "hot", and great for black pepper lovers too. 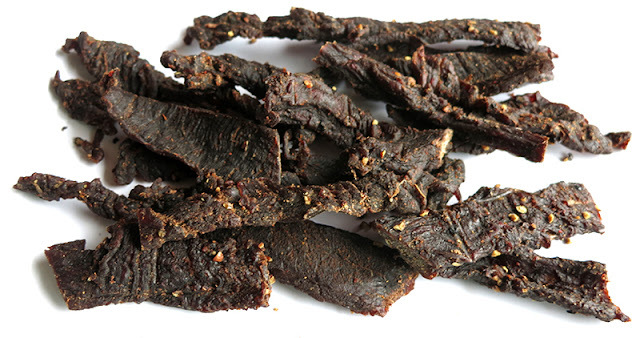 The steak-like chewing texture makes this jerky seem "real" and "natural", as opposed to factory brands that seem gummy, mushy, or crumbly. Overall, I was impressed with its lively taste and meat consistency and chewing texture. 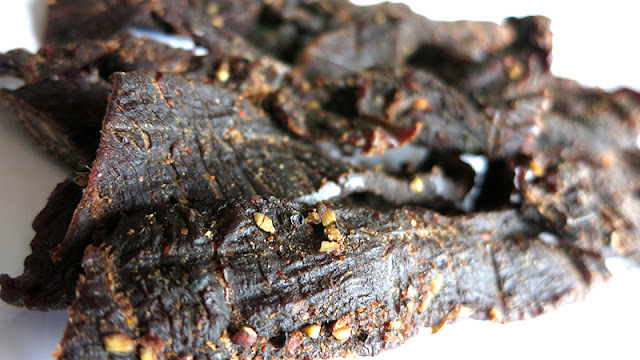 This jerky would go really well with an oatmeal stout.